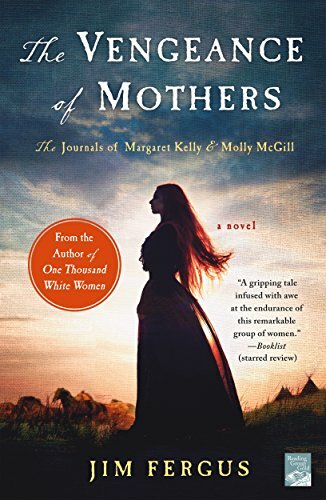 So begins the journal of Margaret Kelly, a woman who participated in the government’s “Brides for Indians” program in 1873, a program whose conceit was that the way to peace between the United States and the Cheyenne Nation was for One Thousand White Women to be given as brides in exchange for three hundred horses. These “brides” were mostly fallen women; women in prison, prostitutes, the occasional adventurer, or those incarcerated in asylums. No one expected this program to work. The brides themselves thought it was simply a chance at freedom. But many of them fell in love with Cheyenne’s spouses and had children with them…and became Cheyenne themselves. THE VENGEANCE OF MOTHERS is a novel that explores what happens to the bonds between wives and husbands, children and mothers when society sees them as “unspeakable.” What does it mean to be white, to be Cheyenne, and how far will these women go to avenge the ones they love? As he did in ONE THOUSAND WHITE WOMEN, Jim Fergus brings to light a time and place in American history and fills it with unforgettable characters who live and breathe with a passion we can relate to even today. I went into this book blind and knowing nothing about One Thousand White Women. Actually, I didn’t even know the book existed. There is a part of me that wished that I had read One Thousand White Women before reading The Vengeance of Mothers. I could have gotten a better understanding of the women who survived the massacre. Saying that I enjoyed the book. The format that it was written in, journal style, was different. I can count on one hand how many books were written in this format that I actually liked. The Vengeance of Mothers has been added to that short list. Besides that, I also liked that the story was told by a whole different set of women. It was through them that we got to see how badly the Indians were treated by the American government. I could understand Meggie and Susie’s need for vengeance. Their friends and adopted families were murdered by the Army. They were slaughtered in their tipis while sleeping. Their 3-week old daughters froze to death and they were forced to carry them when fleeing. Their thirst for revenge was almost all-consuming. That battle scene where they castrated that young man is forever printed in my brain. I could also understand why Molly jumped at the chance to leave Sing Sing. It would be a fresh start for her. She also understood Meggie and Susie’s need for vengeance and she did try to counsel them against it. The author chose to reveal that part of her story after the dance when she and Hawk were sharing a blanket. There were hints that lead up to it but I wasn’t ready for the brutal emotion that it evoked in me. The beginning and end of the story started with a descendant of Hawk and Molly meeting with a descendant of May Dodd. When I started the book, I couldn’t understand why she gave JD a copy of the journals. But after reading the story and the epilogue…I can understand. I just wish that maybe it was revealed a little earlier in the book and not in the epilogue. The Vengeance of Mothers is a well written, fictional account of events that happened in the West. Notice I stressed fictional. The Brides for Indians incentive never existed but the author played on the “What if“. It is the “What If” that made the story for me. The only thing that I didn’t like was that I was left wondering about certain characters at the beginning of the book. Other than that, this book took me on a roller coaster of emotions. Why: Sexual situations, language, and violence. There is a very graphic scene of a young man being castrated and scalped.